Late rains saved most of the 2009 harvest of India, despite a shortfall of 21% in the summer’s rainfall that led to a ban on rice exports, after a 17% loss of production in West Bengal. But 2009 saw the worst deficit in India’s summer monsoon since 1972, while Burma (Myanmar) had its the shortest monsoon season since 1979. It is chastening to recall that, in April 2009, Reuters reported the Indian Meteorological Department as saying, “IMD’s long range forecast for the 2009 south-west monsoon season (June to September) is that the rainfall for the country as a whole is likely to be near normal.” Even an updated forecast in June expected only a small rainfall deficit. Clearly, the unpredictable monsoons remain a problem for meteorology and climate physics. Is there a link between reduced monsoon rains and the Sun’s recent sluggish behaviour, shown by the scarcity of sunspots? Probably. But to clarify the solar link well enough to make better regional forecasts, for even a few months ahead, remains an urgent task. The Asian monsoon, powered by summer sunshine in tropical and sub-tropical latitudes and covering huge areas with a duvet of clouds, is the most important case [for better understanding of regional climate change]. Billions of people depend on the monsoon rains for their prosperity. In the past, failures of the monsoon have often caused mass famine and sometimes the collapse of civilisations. Too much rain has brought unmanageable floods to India, Bangladesh and China. In a stalagmite from a cave in southern China, the layers of annual growth enabled a team led by Yongjin Wang of Nanjing Normal University to show that, over the past 9,000 years, the Sun’s activity has repeatedly affected the wetness of the rainy season. Although their report in 2005 supposed that variations in solar brightness were responsible, the data speak for themselves. A high influx of cosmic rays tends to weaken the monsoon, while low cosmic rays encourage generous rainfall. With fewer clouds over the tropical ocean, the sea surface becomes warmer and feeds extra moisture into the winds that deliver rain to the monsoon lands a few days later. Similar links between solar activity and summer rains are seen over the past 50 years, not just in Asia but also in the drought-prone Sahel of Africa. A fascinating puzzle arises about the three-way connection between monsoons, the Sun, and the El Niño events that raise the sea temperatures in the equatorial Pacific. El Niños are sometimes followed by severe droughts in India, but not always, and use of the Pacific data in seasonal forecasting has led both to false alarms and to failures to predict the droughts. The forecasters will do better if they also take the Sun into account. And if, as Hiremath suggests, cycles of wetter and drier monsoon seasons are linked to the 22-year cycle of solar magnetism, then you can plan accordingly. Farmers might adjust their crops, and irrigators their draw-offs, to suit the prevailing cosmic-ray intensities. And for relief agencies responsible for food aid, the advice is the same as that of Joseph to the Pharaoh. Stockpile food in the good years against the seven years of famine that will surely follow. Climate science ought to be useful. After the Wang et al. (2005) results mentioned here, which used a stalagmite from Dongge Cave in southern China, a Chinese-US team with the same leader, Hai Cheng, reported on a stalagmite from a cave in Gansu province, in north-central China. 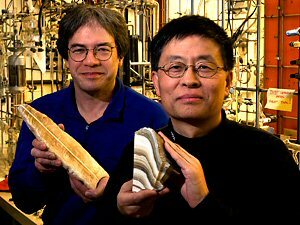 Displayed by Lawrence Edwards and Hai Cheng, stalagmites are slow accretions from dripping water in limestone caves, and they provide historical information about the varying supply of water. Photo: Erika Gratz/University of Minnesota. A record from Wanxiang Cave, China, characterizes Asian Monsoon (AM) history over the past 1810 years. The summer monsoon correlates with solar variability, Northern Hemisphere and Chinese temperature, Alpine glacial retreat, and Chinese cultural changes. It was generally strong during Europe’s Medieval Warm Period and weak during Europe’s Little Ice Age, as well as during the final decades of the Tang, Yuan, and Ming Dynasties, all times that were characterized by popular unrest. It was strong during the first several decades of the Northern Song Dynasty, a period of increased rice cultivation and dramatic population increase. The sign of the correlation between the AM and temperature switches around 1960, suggesting that anthropogenic forcing superseded natural forcing as the major driver of AM changes in the late 20th century. Here two stories conflict. On the one hand, we are given excellent and historically fascinating confirmation of the Sun’s role, as foreshadowed by earlier results from stalagmites. Besides the previous Wang et al. paper, the references very properly include a 1991 paper by Neff et al. entitled, “Strong coherence between solar variability and the monsoon in Oman between 9 and 6 kyr ago,” which reached similar conclusions about monsoon rainfall on the Arabian peninsula. But then we are told, “Not any longer!” After 9000 years in control, the Sun suddenly becomes relatively unimportant, according to these authors. Their conclusion is reminiscent of a 2007 paper by Mike Lockwood and Claus Fröhlich who argued that, despite abundant evidence for solar influences on climate in the past, the trends of recent decades are the result of human activity. Indeed Zhang et al. cite Lockwood and Fröhlich in support of their own verdict. To tell someone trying to cope with a devastating flood or drought or storm that it’s all the fault of global warming is no more helpful than delivering a political speech to the victim of a road accident. It contributes nothing to constructive action. As for forecasting the likelihood of floods, droughts and storms, the regional predictions from different computer models of a greenhouse-driven climate are notoriously contradictory. Attribution of blame, even if fallacious, is not directly harmful. More disturbing is the temptation for climate scientists to play down natural factors when analysing regional climate change. To imagine that natural influences on Asian monsoons have been “superseded” by anthro-pogenic forcing can blunt the efforts to improve the forecasts by better understanding of the Sun’s role. In densely populated South Asia, it would be surprising if human activity had no climatic influence. Quite apart from the recent increase in greenhouse gases, deforestation has occurred over the centuries, and an increase in wind-blown dust from farmer’s fields in semi-arid districts earned the name of “the human volcano” from the late Reid Bryson of Wisconsin. Smoke from traditional wood and dung fires feeds the brown haze that hangs over the Indian subcontinent in winter. And nowadays, as the nations of South Asia industrialize, smoke and sulphur dioxide from power stations and factories add to the atmosphere’s burden. But Zhang et al. run the risk getting the story back to front. Who can assess human impacts on the monsoon well enough for forecasting purposes until climate physicists fully understand the underlying natural forcing – especially solar variability and the El Niño connection – that has operated over the millennia? 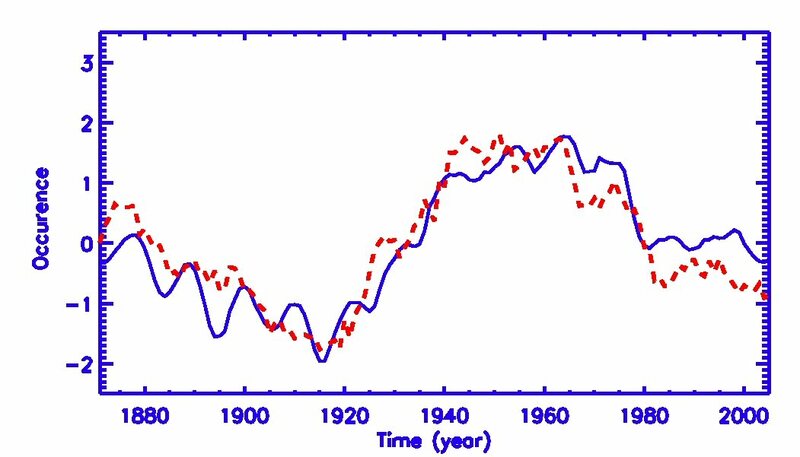 Meanwhile, Zhang et al.’s assertion that everything has changed since 1960 is contradicted in a forthcoming paper in the journal Sun and Geosphere, from the solar physicist at the Indian Institute of Astrophysics in Bangalore mentioned earlier, K.M. Hiremath. He presented its substance in an invited talk at a workshop on the International Heliophysical Year and Basic Space Science in Sozopol, Bulgaria, in June 2008. What Hiremath does is to identify the paradoxical long-term trends, 1871-2005, with solar activity increasing and rainfall diminishing. Rainfall in red and solar activity in blue (derived from sunspot counts) provide the wiggly curves and Hiremath adds the trends shown by the straight dashed and dotted lines. Here Hiremath subtracts those long-term trends from his two sets of data, which he averages over 10 to 22 years. To reveal a persistent close association between between solar activity (blue) and rainfall (red). Hiremath says the statistical correlation in the second graph is very high, at 80-90% for the various periods of averaging. 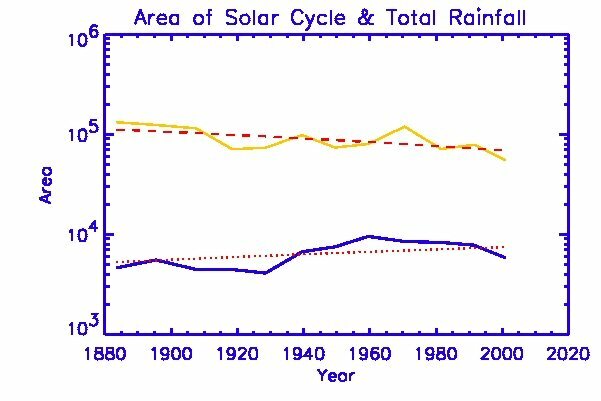 Whatever else was going on after 1960, because of changes in other natural influences and/or human factors, you can see by eye that the Sun’s effect on rainfall in India remains very strong, into the 21st Century. That still leaves major questions to address, if the aim is better forecasting of monsoons. 1. Is the solar connection just a matter of heating or cooling, or does it involve a direct effect of galactic cosmic rays on cloudiness over the Indian Ocean? 2. By what mechanism does the El Niño affect monsoon rainfall so badly? Its teleconnection to Asia may go around the world via the North Atlantic region, as indicated for example in Hiremath & Mandi (2004). Perhaps that’s where to look for fickle behaviour that explains variability in rainfall. It is worth noting that the big change in the late 1970s, seen in the right-hand figure above, coincided with a “regime shift” in the upper ocean temperature structure in the Pacific Ocean (Stephens et al. 2001) and with a “climatic shift” at the Pacific and Atlantic ocean surface and atmosphere (Tsonis et al. ref. 2007). 3. On the other hand, recent research by oceanographers in Japan and France (Izumo et al. 2010) suggests that the Indian Ocean doesn’t merely obey the Pacific Ocean, but can hit back, with events in the Indian Ocean triggering El Niño. When the sea-surface temperatures are warmer than average in the western Indian Ocean, and cooler in the east, the “Indian Ocean Dipole” is said to be positive – and negative when the pattern is reversed. A positive Dipole tends to occur at the same time as El Niño, and a negative Dipole co-exists with the opposite condition called La Niña, when the equatorial Pacific is unusually cool. But Takeshi Izumo of the University of Tokyo and his colleagues claim that a negative Dipole predicts an El Niño that will peak 14 months later, whilst a positive Dipole often precedes La Niña. They suggest that Dipole conditions in the Indian Ocean coming to an end in November–December cause a sudden change in the winds over the Pacific Ocean. 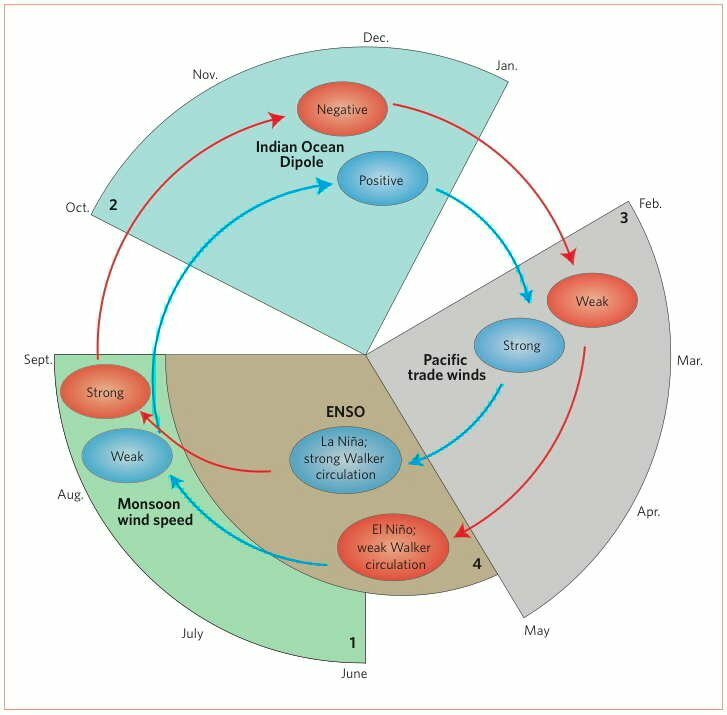 Events in the Pacific linked to ENSO (El Niño-Southern Oscillation) can strongly influence monsoons in India, with El Niño events often causing droughts. But according to this diagram in Nature Geoscience by Izumu et al. (see reference below) shifting sea temperatures in the Indian Ocean Dipole can react upon the Pacific winds and on El Niño. 4. If there is progress in understanding these complicated and interacting natural influences, how will that affect the assessment of the human climatic impact in South Asia, and its influence on rainfall? 5. Even when there is better grasp of what’s going on, how predictable will the monsoons ever be? Forecasts of El Niño are difficult and, as for solar activity, a widespread failure to predict the prolonged absence of sunspots in 2007-09 was a fair reflection of the state of the art. While Hiremath is optimistic about solar forecasting 200 years ahead (Hiremath 2008), as a basis for long-term monsoon forecasting, Svensmark thinks that attention should be paid to devising more trustworthy 3-month forecasts, perhaps leading in the years ahead to broad-brush predictions for about 20 years. Whether the emphasis is on short-term or long-term changes, the puzzle of the Asian monsoon remains high on the agenda for research on the solar influence on climate. It would be good to see closer collaboration between physicists in Europe, India and China, in research that needs to look far beyond the glib generalizations about man-made climate change. Climate science, as we said before, ought to be useful. This entry was posted on Saturday, May 1st, 2010 at 17:05 and is filed under 3d) Updating The Chilling Stars. You can follow any responses to this entry through the RSS 2.0 feed. You can leave a response, or trackback from your own site.